GOSPORT snooker ace Mark Lloyd has collected more silverware as the countdown continues towards the most important match of his career. Lloyd (pictured) now leads the Cuestars South of England Under-21 Gold Tour rankings after collecting his third winner’s trophy this season. 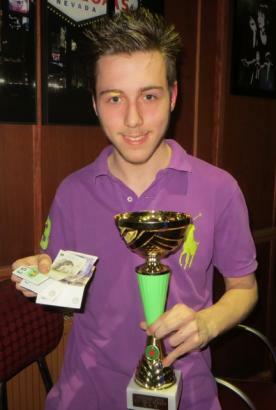 A 3-1 victory from 1-0 down against Anthony Rice, from Fordingbridge, in the final of the seventh leg on the new professional table at Fareham Snooker Club earned the 15-year-old £45. “I started off a bit shaky but I just found something that made me play a little bit better,” said Lloyd, who compiled a 50 break in the third frame. Earlier, Stewart Ball (Greenbaize, Bournemouth) beat Sam Storey (Crucible, Newbury) in a one-frame tie-breaker for the best third-placed player from the two groups of four as they had identical records. Lloyd leads Brad Chappell (Greenbaize, Bournemouth), who was knocked out by James Budd (Stoke SC, Gosport) in the quarter-finals, by five points going into the eighth and final leg at Salisbury Snooker Club on Sunday, May 3. Rice is 12 points further back in third. But it’s a tournament that Lloyd, also based at Stoke SC, may miss as he is due to take on Jack Harris (Walsall) at the EASB finals weekend on May 2-3 in the final of the English Under-16 Championship. It all depends on which day the national governing body allocates for the match. Faced with the prospect of national glory, Lloyd admitted: “It wouldn’t be too bad to do well in that. Lloyd is 26th on the EASB Premier Junior Tour, which is restricted to the top-49 under-21s in the country, and has earned himself an invite to the European Under-17 Championship in Malta next year. ROUND-ROBIN GROUP A: 1st, Mark Lloyd (Stoke SC, Gosport); 2nd, Jonny Mutch (Cambridge SC); 3rd, Anthony Church (Greenbaize, Bournemouth); 4th, Mickey Joyce (Chandler’s Ford SC); 5th, Nathan Farmer (Stoke SC, Gosport). ROUND-ROBIN GROUP B: 1st, James Budd (Stoke SC, Gosport); 2nd, Mark Wells (Greenbaize, Bournemouth); 3rd, Stewart Ball (Greenbaize, Bournemouth); 4th, Callum Browne (Player’s, Westbury). ROUND-ROBIN GROUP C: 1st, Anthony Rice (Salisbury SC); 2nd, Brad Chappell (Greenbaize, Bournemouth); 3rd, Sam Storey (Crucible, Newbury); 4th, Jamie Wilson (Copnor SC, Portsmouth). QUARTER-FINALS (12 points): Lloyd 2 Ball 1, Budd 2 Chappell 1, Rice 2 Mutch 0, Wells 2 Church 0. SEMI-FINALS (15 points): Lloyd 2 Budd 1, Rice 2 Wells 0.